Welcome to the new CFH website! SOON you can sign up to be a website member, and we'll be able to work on a better mailing list and system of sharing news with you. Due to space limitations we can't allow everyone to upload like crazy, but we've now got the ability to share a lot more images with you. We're in the process of uploading them, so keep an eye out for more! Having a discussion section was a nice surprise to us—and we hope it will be fun for you. We're kicking the tires on it, so try it out and see how it works. We'll post your event on our calendar! Let us know when your events are, time/date/location, contact info. Your feedback is most welcome—are there things that don't make sense? Items you access regularly that seem hard to find? Information that just doesn't seem to be here at all? Features of the previous site that you miss? Please let us know what you need; our goal is to help you to help our heroes even more, and this new site is just one more step toward doing that! Mailroom Mondays: Information is now available in the MAILROOM and is still updated on Mondays. Thankful Thursdays: Information is now availalble in the MAILROOM and is still updated on Thursdays; since it's no longer a blog, we will keep two weeks'-worth of listings on that page. 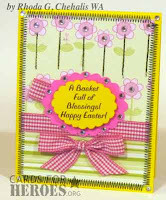 Feature Fridays: Check out the Featured Cardmaker Blog for those! So, what will be posted here on the new Homefront Blog? All the other news that's fit to print! One more note: This is now a paid site, whereas Pam's generous gift to us on the old site was hosting it for free. If anyone would like to contribute toward our monthly site maintenance fees, please feel free to make a paypal gift and designate it to "website maintenance" in the notes section, and we'll honor that usage of your dollars. Thanks! Some crafters love to make one design again and again. Others only do that when in a hurry to fill a box or meet a goal. And some have told us many hurdles they had to overcome to meet that goal they'd set. What happens to multiple cards? We're happy to receive multiples. Four or five of a card, up to ten or twenty. We mix them up with others' cards in a number of boxes so they go to as many people as possible. Typically we try not to put more than a few of one design in a box - we love to create exciting "eye candy" for our heroes as we can when they look through your cards! Please limit holiday multiples to 30, and get them to your shipper in plenty of time before a holiday - a few weeks before the posted deadline. This gives them time to mix them throughout the boxes. Anytime cards can be in any quantity, since we're not in a hurry to get them shipped. Please don't let yourself be pressured by a goal you've set—either a particular number of cards, or to fill a particular size box. We've noticed some folks try to send hundreds and hundreds—which is fantastic—but do remember that thousands of others are also joining in this work. No single person should ever feel pressure to set super-high goals, and then suffer creatively because of it. A package of 20 cards you've enjoyed making can be just as fulfilling—if not more—than 100 you couldn't stand finishing. And others are out there making cards as well, so we're all in this together! We all have to constantly remind ourselves that cards aren't a life-or-death item for our heroes. If we lose perspective and feel like a hero's communication with their loved ones depends solely on us (and often the letters are an 'extra' since most of them do have at least occasional email access)—the pressure can overwhelm our joy, and that would be a tough state of mind to inspire anything creative! Crafters who love to make many of one design. If you really do enjoy it, go for it! Cardmaking parties—especially with newbie crafters. Having them copy one design is often most efficient! When not to mass produce? When you're feeling pressured by a goal you set for yourself, size of a box you're trying to fill, or commitment you made to one of our shippers. Breathe deep....and just relax. When you're no longer having fun! If tying one more ribbon makes you want to scream—put it down. Go make a unique card, even if it takes 5 times the amount of time as that one card. It's okay, give yourself permission to be creative! When a holiday deadline is looming. 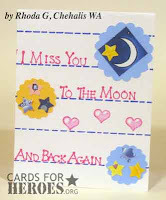 Try making general cards instead, and let yourself relax about when that box gets in the mail! Holiday cards that arrive past the deadline WILL be sent out the following year, so your efforts aren't ever wasted. When you're sending a box riiiiiight at the end of a deadline, it's toughest for us to mix identical cards with others. We begin sending that holiday a few weeks prior to our published deadline, so if you send 400 of the same card on the last day—we may only have those to send in the final boxes. So be freed of pressure. Give yourself permission to lower that goal. Use a smaller box or envelope, and enjoy the craft that you love so much. This is supposed to be fun! I live in a very small town with my wonderful husband Ron we have 2 kids. Matt, Grown and living in Seattle as an attorney and our daughter Fallon attending Eastern WA Univ. in Cheney, WA. Double majoring in early childhood development and english. We have a great Lab named Molly too. (Spoiled, just like the kids . . . LOL We used to travel lots for my husband is retired, however I through a kink in that, by becoming disabled. Oh well life marches on . . . I started scrapbooking about 10 years ago doing it a little off and on. I drove school bus for 9 years until I became disabled. Then I started making cards for the family and friends, which I found I like doing better. How long have you been making cards? I have been making cards for about 3 years now. 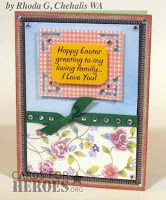 I can do more cards and I seem to use most my scraps. I myself would prefer to get a handcrafted card rather than a store bought, for to me it means more!!! How did you hear about CFH and how long have you been making them? 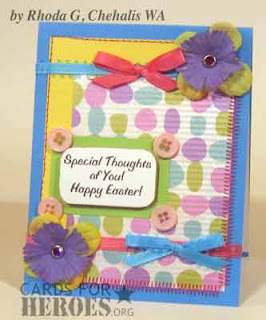 When I found CFH through Cardmaker Magazine, I contacted Sandy ASAP and in short order I was making cards and that only started in the end of January this year and in February I met up with Sandy and gave her 75 and then sent her another 20 Easter cards in the mail. Making cards does not require me to sit long periods of time or stand long either.. So it's just up my alley. What is your favorite Kind of card to make? 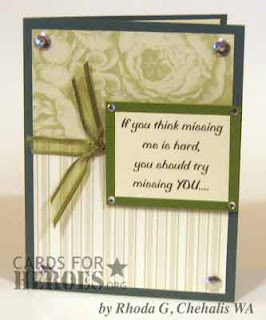 That would be ~ Thinking of you cards, that are blank on the inside so the soldiers can write all over in them!!! Do you have a special technique you love to use? Are there colors, style or a product that draws you? I guess it would be anything that catches my eye. I really like elegant cards, but I'll make just about anything. Some are quick one other take me a bit longer, and more thought. Scrapbooking places love to see me come, because I like a little of everything. Right now I'm working on flocking. So far so good! Takes a bit longer but I'm sure as I get better at it, it will be quicker. How often do you make cards? I try to make them everyday but I must confess I have made only 4 cards since my last batch to Sandy :-( I have been sick, My husband's Mother passed away a week and a half ago in Illonois, quick trip (bless her soul, she was 98) and now our daughter home for spring break and I use her room. For some reason she pushed all my stuff to the corner and has taken over, you would think it was her room.....LOL Oh well I'll get started next week again when she goes back to school....HA! HA!!! What motivates you to make cards for heroes? My husband was in the military, so were my uncles, I a have nephew and one of my great friends husband and son-in-law who are all in. Plus it give me purpose to do my hobby. I suppose in general it just give me purpose! Twinkle twinkle little star ... that may be a sweet song, but we need to keep our heroes from twinkling! 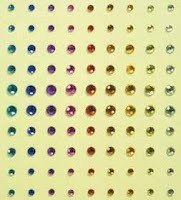 Our no-glitter restriction is one that's been tough on a lot of our cardmakers; who doesn't like a little bling? Well, we have very important reasons to stay away from glitter, and once you know, you'll start looking at that bottle of glitter with a new perspective: safety! 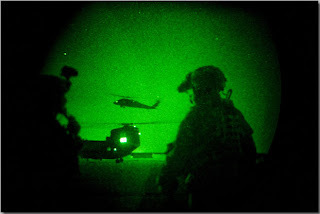 Night vision goggles are in common use on battlefields, not just by the U.S. military, but by enemy forces as well. What kinds of things can these devices see? Anything shiny stands out. If our heroes open a box of cards with glitter on them—they can get it all over their uniforms. Some of our contacts are in forward-deployed areas where a shower or laundering is rare, sometimes weeks between opportunities to clean up. Even if it's practically invisible to their own eyes, a uniform with glitter all over it will shine and twinkle across a mountainside in Afghanistan, and make our service members visible to the enemy. It's even easier to understand why cards with glitter wouldn't be wanted in a CSH (combat support hospital) setting—what a mess it could be! If you send AnyHero cards intended for injured heroes (to us or to any other organization), stay away from the glitter bottle. As you can now see, it's our part in the war on terrorism to keep the glitter away from our heroes. We all have a role in keeping our nation safe, even crafters! Please help our shippers by donating your glittery cards to other organizations that don't have the issues that our armed forces are dealing with. "But are there options for just a little sparkle? Please?" Some of us (the writer of this post included!) need to sit our inner child down and let her know she can't play with the glitter bottle. But if she needs her "fix," here' are a few suggestions for you! But remember, in all things, moderation—our heroes are too important to us to risk their health and safety! Add a little twinkle with a well-placed gem! These are watercolors that have a sheen to them; the company is going out of business soon, so if you need some colors, shop soon! There are a few papers that have glitter that is sealed; be certain that it will not flake off, even if you abuse the paper a little. Our shippers will check them when your cards arrive, but it helps if you don't even send ones that flake off. These pens put a tiny amount of sparkle on within the thin ink used. The only caveat about these pens—if you try to color a large area or color a spot over and over, the built-up sparkle WILL flake off after drying. So use it sparingly, just a little to highlight the center of a flower or a tiny area. Thanks for protecting the health and safety of our service members! About Nancy: I’m a retired Teacher/Principal from a little country school in the hills outside of Hollister, California. When we retired in 2004, my husband and I took off on our Harleys and spent 44 days traveling 8100 miles through 25 states. During that trip, I decided I wanted to make a scrapbook of our adventures for our grandchildren. That’s when I got into paper crafting. I’ve been making cards since 2005. I like it better than making scrapbooks because cards bless people immediately. In addition to Cards for Heroes, I make cards of encouragement each month for 28 Christian missionaries in 10 different nations around the world. How long making them for our heroes? 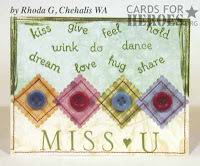 I began sending cards to Cards for Heroes in October of last year. How did you hear about CFH? What’s your favorite kind of card to make? My favorite cards to make are cards of encouragement. I love all different techniques. I’m kind of like they say, “Jack of all trades… master of none!” Seems like I’ve always got a “newest favorite” technique! Are there colors, style, or product that draw you? My favorite products are any kind of scraps or pieces of trash. I love the challenge of taking what most people consider “non-usable” items and turning them into nice cards. I really like the idea of Cards for Heroes. My parents were both veterans of WWII, my husband was in the Air Force for 6 years, and our youngest son is currently in the Air Force. I guess that’s my motivation. I’m married and live in Holliston, Massachusetts (suburb of Boston). I live with my husband, Larry, and our 2 kids - Victoria (14) and Zachary (11). My husband and I own a personal chef business, as well as an online bookselling business. In my spare time that I’m not cardmaking or scrapbooking I enjoy travel, movies, dining out, reading, and getting together with friends. I’ve been scrapbooking for about 5 years now, and started making cards shortly thereafter. I have been making cards for our heroes for over 2 years now. My daughter Victoria started making cards for the heroes as a bat mitzvah project, and I quickly joined in with her. Our first attempt we sent over 800 cards. I then found Cards for Heroes online and am excited to be part of this wonderful group. I first heard about CFH on 2 Peas in a Bucket. I really enjoy making general/blank cards. I think it allows for flexibility when using the cards - it’s all about efficiency! LOL! I just got a cuttlebug, and I have really been enjoying it! I tend to have a very “simple” style, and try not to over embellish. I do enjoy coloring my images, and finding just that right piece of patterned paper to use! I know how much it means to me to receive a special card in the mail from a friend or family member, so I can only imagine how great it must feel for our heroes families to receive a card from them! I love the art of letter writing, even though I don’t do it enough myself. I am also thrilled to have come on board as the newest CFH shipper! It is a project that my whole family is involved in and we just love it. We are always looking for things to do OTHER than watch TV, and this project allows us to have a lot of family time together while working for a great cause!